The Coopered Tot: Whistlepig The Boss Hog - A Rye Whiskey Monster Amid A Background Of Deception And Damage Control. 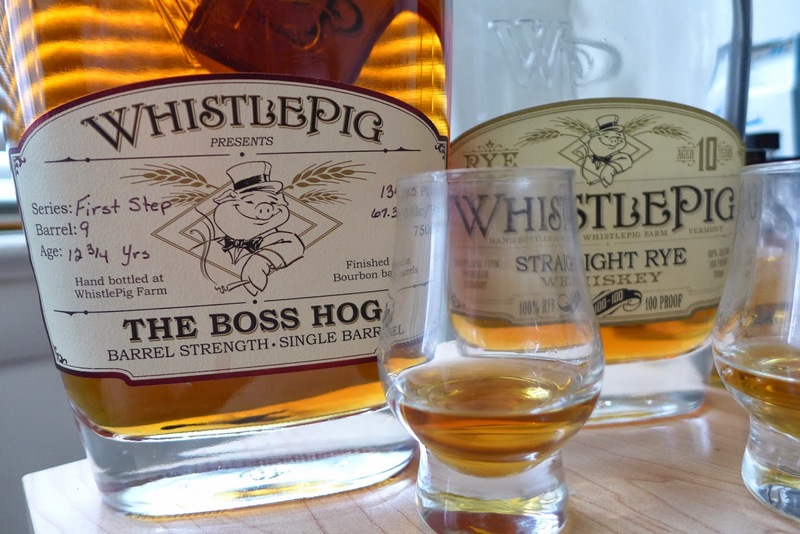 Whistlepig The Boss Hog - A Rye Whiskey Monster Amid A Background Of Deception And Damage Control. A few days ago Davin De Kergommeaux, Malt Maniac, leading Canadian whisky blogger, and noted author of the most significant book on Canadian whisky, wrote a piece in whiskyadvocate.com called "A Revealing Chat With WhistlePig’s Raj Bhakta" that contained the information that "the makers of WhistlePig rye were finally ready to “come clean and confirm that the whiskey they bottle is from Canada"
It also had the bombshell that Whistlepig will be a vatting of 5 different rye whiskies in the future (the Alberta Distillers it has always been bottling, plus "We are growing our own rye on site and contracting whiskey from three distilleries in the U.S. and two in Canada." Although Bhakta corrects this by stating that all the whiskey out now - and in the near future is the same Alberta Distllers only whisky it has always been since the brand launched in 2010. The 5 origin stuff is aging and will on the shelves somewhere down the road. In the brief television spot, Bhakta says that Whistlepig is the only "aged" rye on the market at 10 years old. An interviewer point blank asks him about Sazerac and Michter's (who market rye whiskies aged 18 and 25 years old respectively) and Bhakta doubles down. Later he reiterates the lie that Whistlepig is American and that it's patriotic American thing to drink it. This is a howl because it's a Canadian product lock stock and barrel. All Bhakta's crew does is rest it and then bottle it. He also says that only aged (i.e. older than 6 to 7 years old) ryes are sufficiently aged and worth drinking. As someone who loves younger ryes like Thomas H. Handy 6, Russell's Reserve Rye 6, Willett's Family Reserve Single Cask ryes as young as 3 and 4 years old, etc... I can attest that some of the finest ryes you can drink are quite young. Rye's herbal spice, like peat's fiery kick, is fresher and fiercer in young whiskey. Aged rye picks up lovely mature flavors at the expense of the herbal kick and heat. Thus choosing a fine younger rye to get that freshness and power is a totally defensible epicurean choice. Pretty much every word that came out Bhakta's mouth in that spot was wrong. Although, certainly, in most of the interviews, Pickerell side steps the issue of origin and just talks about the whiskey - often leaving the incorrect impression that he's actually make it and that's an American made product. But the fact that Pickerell plainly publicly told the truth for years explains why the true story was so widely known. One wonders about why the lack of transparency sometimes and not others? Certainly Whistlepig's label itself is part of the deception. "Hand Bottled at Shoreham, Vermont" appears on both front and rear labels but not a word is there about where the whiskey was actually distilled. The controversy is good in that it has brought the truth out and is a lesson for others who would hide the truth. Other examples of this kind of thing, Templeton Rye, Michter's, Widow Jane have similar trajectories. Some people will boycott because of the lack of honesty. I can understand that, but I'm more interested in whats going on in the glass - particularly if you can't source the juice from the original distiller as is the case here - in the USA market. A fascinating detail of De Kergommeaux's interview is the story that Pickerell had a line on a supply of extremely good aged 100% rye whiskey from Alberta Distillers and was in search of a a vendor to buy it and bring it to market. Pickerell then found Bhakta who had a farm and was looking for a whiskey project and the WP thing was born. This would explain the apparent paradox of a brand new company suddenly putting out richly flavored fantastic rye whiskey on day one. And, make no mistake, the whiskey is certainly good. In 2012 I did a double blind head to head of a number of Canadian 100% ryes bottled in the USA - a group that included Masterson's Rye 10, Jefferson's Rye 10, and Pendleton 1910 Cowboy Whiskey. Thomas H. Handy and Old Potrero were also in there - not as blinds because they are so distinct. In the finale, the Handy won overall, but of the ones that playing on the same level of proof I found Whisltepig the winner. 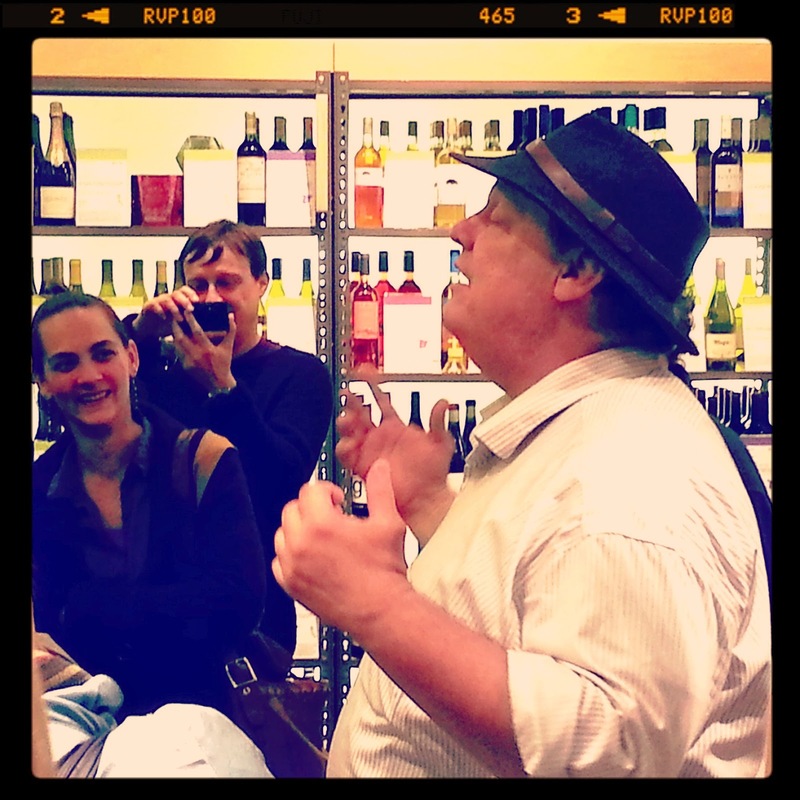 Dave Pickerell tells the story of the Frenchman asking Raj "Have you seen the Wheeestlepig?" 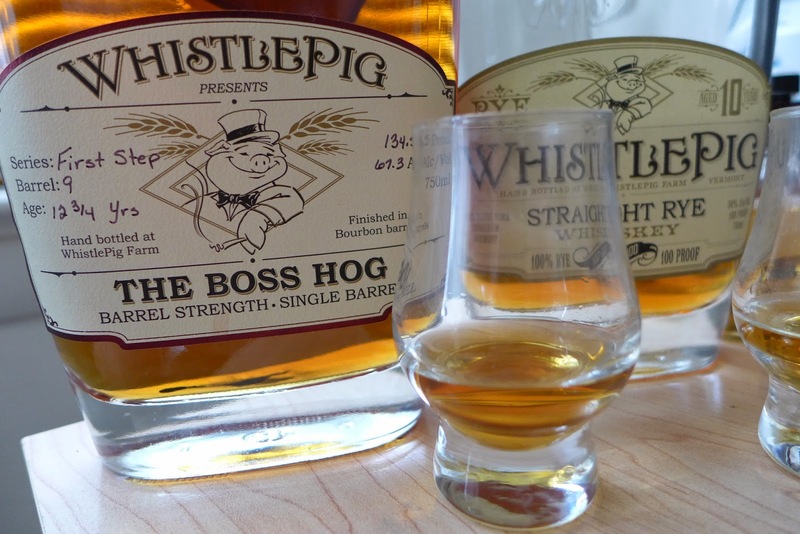 A few months ago I caught up with Dave Pickerell at Bottlerockets Liquors in New York where he was introducing a new limited edition version of WhistlePig called "The Boss Hog" that consisted of hand selected casks that were allowed to mature an extra couple of years. The results were bottled at full cask strength. The whiskey was interesting and I signed up for a bottle, but the critical reviews upon its release were mixed with complaints about cost and flavors. I couldn't tell if it was a question of barrel variation (it's a single barrel product and a number of barrels were bottled) or just a question of people being able to handle the power and flavor of the product. After having tasted a few of the barrels (6, 8, and 9) I'm leaning towards thinking it's the latter interpretation. The Boss Hog Barrel 9 12 3/4 years old 134.5 proof. 67.3% abv. Nose: floral honey, dusty cut yellow flowers, herbal lavender, cilantro, ivy, and oregano. Plus there is a salty acidic note. Sku describes it as "pickle juice". It's hard not to see it that way after hearing that. Palate: POW! Honey sweet in the first seconds and then, rapidly, a huge expansion chock full of toffee-caramel roundness, cut ivy, alfalfa, cilantro, briny pickle squirt and floral herbals attack with abandon. The mouth is completely filled. The turn to the finish is marked by sweetness fading into complex herbal bitters with lingering anise-seed sweetness and nuttiness. The finish is medium long on oak and herbal bitters all the way home. This is the pure rye flavor profile on steroids. It has a vividness and intensity that is all but unique. Thomas H. Handy has the rye flavor profile at the same level of power, but with a mash bill that expertly melds in the toffee citrus of corn. I give the nod to Handy overall, but as the pure essence of rye, this is pretty special. That said, it's herbal, bitter, intense, and hard to take. It takes water well, hanging on to a little bit of a darker richer note than the usual 10 even at comparable dilution - but the difference is slight. Given the high cost (between $130 and $175 - the former at Shopper's Vineyard, the latter at Park Avenue Liquors) this is too expensive to justify the slight difference between this and the 10 at comparable dilution. What you're paying for is the thrill ride of having it neat. At full power this is intense stuff. The Stagg of Pure Rye. Given the news that Whistlepig is changing the formula in future batches, this might be the statement expression of the pure Alberta Distillers stuff. If you are a fan of this flavor profile it might help justify the long green for you. Whistlepig 10 - 50% abv. This is very close to the same stuff all around - just taken down to a more humane 50% abv. It's rich delicious heady whiskey and has been among my favorite ryes for years. The nose is dramatically muted by comparison. Everything is dramatically muted by comparison. Still, this is redolent of dust, preserved citrus, and light florals. The entry is sweet with jammy citrus, spicy on the expansion with complex herbal ivy and cilantro notes. Well balanced tasty oak and herbal bitters on the finish. Still one of my favorite ryes, but it steps aside when the Boss is on the same table. As an Albertan and lover of the entire line of products put out by ADL, it makes me sad to know that the boys in Ogden Park have stocks of apparently phenomenal rye and are cutting them with blander base whiskies to make their standard Alberta Premium and Alberta Springs 10 expressions. It's an unfortunate mold that most Canadian whisky makers are stuck in, that the concept of "straight" whisky has never truly caught on north of the border. This mystifies me as well. Of course it's not just Canadian distillers. Scotch whisky companies take single malts that could be great if properly matured and blend them into less than interesting younger cheaper blends. But as Oliver Klimek has written, this pays for the niche products, like high end whisky which survives as the icing on cheap whisky's cake. Excellent whiskies are the result of barrel selection as well as careful aging. The barrels that don't make the cut end up in the less interesting offerings such as blends. You can't assume that all the cheaper stuff would have been good stuff if it weren't squandered in cheaper blends. The selection angle is key. Josh, the other thing that tipped people off early on about the origin of Whistle Pig, other than Pickerell's YouTube videos, was the "Made in Canada" statement on the back of the label. That seems to have disappeared. Good point about the young vs. old ryes, I'll add to your list of young tasty ryes High West DoubleRye. It sounds like you're buying the "bombshell" about the five ryes that WP will use for their formulas. That's a very vague statement of intention, rather than of facts, coming from someone with, as you aptly point out, "a background of deception". Why would I start believing him now? "“It’s fairly common knowledge that that’s where we started,” Pickerell said of ADL. “What’s not common knowledge is that’s not where we are now. We are growing our own rye on site and contracting whiskey from three distilleries in the U.S. and two in Canada.” One of those Canadian distilleries, however, is still ADL." I've heard good things about High West's Double Rye. Shane Helmick's review was glowing. Enough for me to buy a bottle on the strength of it. Thanks for the recommendation. I look forward to cracking it. One more thing, on the question of barrel variation vs. people not knowing their way around a rye. I bought a bottle of regular Whistle Pig some 3 years ago. It was hot and awful and I could not drink it, at any strength and with any amount of time in the glass. I got rid of it. It's impossible that anyone would have awarded this same juice 90+ points. So I'm convinced of the reality of batch variation (same story applies to Jefferson rye, incidentally, as discussed elsewhere by Jordan Deveraux and Michael Kravitz). Moreover, it's my opinion that some producers cherry-pick their barrels/bottles sent for tasting, as opposed to the main market. Did you taste your barrels, #6, 8, 9, in the context of a Whistle Pig tasting, or picked randomly from a shelf of some store (or sent by fellow whisky lovers)? It could make a difference. I for one will not buy another bottle of WP, not as much out of principle, but because I got burned, and I don't like to put down $70 or $120 to play whisky roulette. Good points, Florin. Although Pendleton's 1910 tastes quite different, I understand it may be the same source, but via a different production method. Clearly Masterson's Rye and Jefferson's Rye 10 were the same stuff as Whistlepig (although Jefferson's is apparently switching to MGEP/LDI rye now). 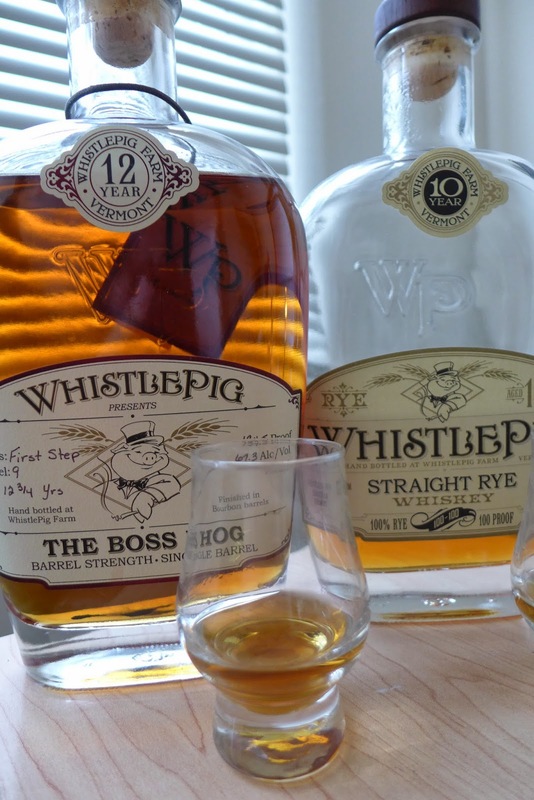 Whistlepig is not unique - but it has an usually good flavor profile even among those peers (and a higher price tag than any of them too). Your batch variation story is troubling. I've had several and they've all been fine. But I've heard stories of bad bottles from others. The samples of Boss Hog that I've tried are a mixed bag. One I had at the Bottlerocket's tasting (i.e. selected). The other two were random selections from liquor stores. I found them all to be quite similar. Batch variation is not unique to WP, of course. I've had occasional bad bottles even from very good distilleries. For example, I went to a Balcones tasting where the bottle of Rumble was corked and had a musty, slightly bitter, flavor. They put it away and immediately selected a different example. At home, if you hadn't tried it elsewhere, you'd have no idea and probably assume that the product as a whole was bad. Fortunately things like that are rare. One subject that I haven't seen discussed much is the newer addition to the label that the whiskey is now "finished in Bourbon Barrels" Rather than just being allowed to age for a bit longer did the Boss get put in used barrels for a couple of years of finishing at the "farm" after it arrived in the tanker truck from ADL? Early bottles of WP10 did not make any mention of this "finishing". But now all the WP line says that, including labels on newer bottles of the WP10. I have yet to try a SBS of the older WP10 that makes no mention of this finishing with a newer 10yo that does but in comparing the old WP10 with the current Boss Hog I felt there was some degree of difference that wasn't just from the greater proof. Of course 2+ additional years in any barrel is likely to make a difference! "Now whiskey is a product of age. The wood gives it it's flavor," Wither said. "And what makes ours so special is we do about seven years in new oak barrels, then we switch it into barrels that had bourbon in it. It gives it a sweeter finish and makes it a very palatable drink." BTW the bottle of Boss Hog that I bought at retail (a batch 10 bottle) did not have any real brine or pickle notes that I could perceive. Doesn't mean they weren't there but my palate couldn't find them! I liked it a good deal more than an early 10yo WP I tried SBS although I am still not sure it merits the premium in cost. The "pickle" note is really just an acknowledgement of a touch of acid tartness. You find it in Clynelish Scotch whiskey as well. It's not a big dill pickle flavor - more a bit of tart and vegetal plant kind of flavor. Salt is more of an overtone in whisky - an aromatic - than actual saltiness. Tasting notes are poetic. Bhatka doesn't seem to know how to tell the truth. Besides lying on his label, none of the initial construction he did for the bottling and office facility even had a building permit. He tried to ignore Vermont construction and permitting laws, was going to dump their distillery waste water in the manure pit (which over flows into the river) and rumor has it they installed a bathroom in their bottling/office facility which dumps into the manure pit. He has spent thousands of dollars trying to avoid regulation. He is just a rich jerk who has no regard for anyone but himself. I sure hope those rumors don't turn out to be true. That would be truly short sighted and pound foolish. It does seem clear that WP is pursuing permits to build a distillery on the farm. If they get that project off the ground there will be much more regulatory inspection. Basic building code violations will turn up and be a problem. I hope, for their sake, that they aren't messing around with that. If they are that will speak to both character *and* intelligence.